I used to disregard toners in skin care because I feel that they're doing nothing to my skin, except refresh it. However, that opinion changes when my skin type turns from very oily to combination/dry. I feel that after washing my face and applying moisturizer is not hydrating enough, so I gave toners another chance to proves themselves. I'm very picky in choosing toners because I want them to be free of alcohol, witch hazel, menthol, camphor, and tea tree. Those ingredients tend to cause further irritation on my skin and trigger acne to form on my face. So, last month, I went to the mall with my bf when he suddenly looked at my face and asked why my skin around the edges of my mouth was peeling off. I looked in the mirror and noticed flakes of skin on my chin. It was so bad considering I used to have very oily skin and now here I am dusting away the dry, flaky skin. Anyway, at that moment, I realized that I needed to add another step before applying moisturizer, i.e. toner. We walked past TheFaceShop and I browsed around looking for a hydrating toner with added benefits. I asked the SA which would be suitable for my dry, flaky skin and she suggested the Arsainte Eco Therapy Tonic with Essence. She thought that it would help my dry skin because it is a toner+essence (serum) in one. I purchased it and used it for 2 weeks. 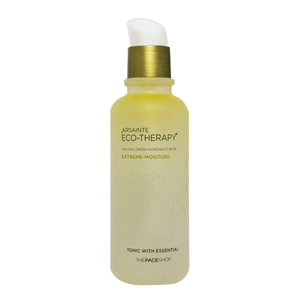 Toner that comforts and relieves stressed and dehydrated skin. It contains essential oils, whch gives a pleasant scent to the toner whilst golden palm oil provides further nutritive moisture to the skin. Because of these oils, an oil layer is visible at the top of the bottle and thus it needs a gentle shake before use. No stabilizer is added so as to deliver this toner in its purest form. Pour about 3-4 pumps onto a cotton pad and swipe it all over the face. Pouring about 5-7 pumps onto a compressed facial mask and use it as a face mask for 10-15 minutes. This is my favorite way of using this as it made my face looks plump and healthy. Ingredients-wise, this fulfills the criteria I have above for toners. I'm the same as you when it comes to toner; sometimes I believe that it doesn't do anything else than refresh the skin and when I do use it I'm picky because I definitely don't want it to contain alcohol and menthol as those tend to irritate my skin as well. This one though sounds great especially since it has the added benefits of essence to it! really help me to choose what I need.